There’s something magical about placing a few simple and easy to find ingredients into a frozen pop mold, waiting overnight, and then sliding out a delicious and creamy frozen treat. 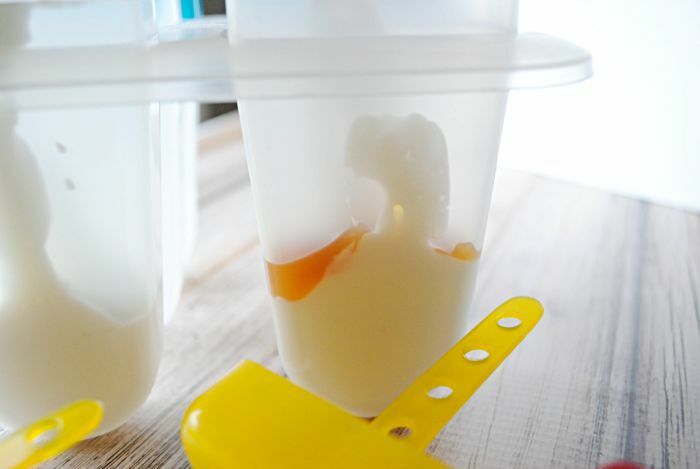 Making your own frozen yogurt pops lets you add so much more than when you just unwrap plastic packaging! These frozen yogurt pops star Yoplait® Greek 100 Banana Caramel yogurt, sliced bananas, and caramel sauce. Start with a layer of yogurt in each mold then follow with layers of caramel sauce and banana slices. You create your own combination here! Once you’ve filled each frozen pop mold, follow the manufacturer’s directions for proper freezing. My molds needed to freeze overnight, so after sticking the holder and stick in, they went straight into the freezer. These frozen yogurt pops are a perfect anytime snack – or you could treat yourself at breakfast time! Yoplait® Greek 100 yogurts come in so many different flavors, you’ll never get bored! I love a yogurt as my grab-n-go snack, so these frozen pops are perfect for the hot days of summer! Every time I shop at Walmart, I load up on my favorite varieties, Greek 100 and Whips, in just about every flavor they make!